@OsborneDavid: Public schools choice — which includes charter schools — boosts equal educational opportunity. Private school choice — vouchers — destroys it. 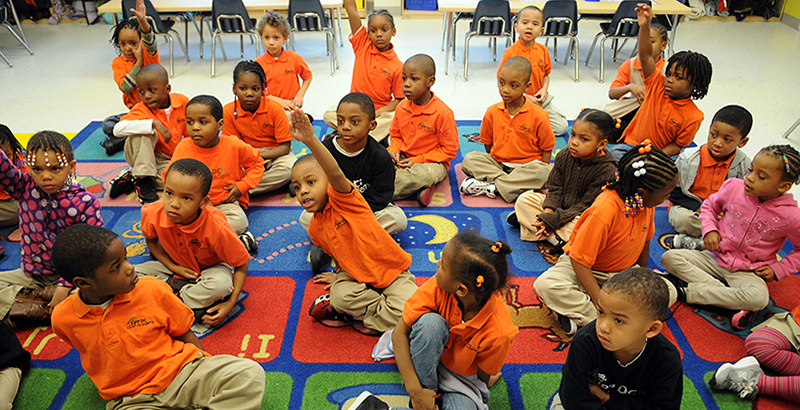 For National School Choice Week, we must decide which we want. @OsborneDavid: It’s National School Choice Week once again. What exactly are we celebrating? It is National School Choice Week once again. But what exactly are we celebrating? It would give public money to families to pick any school, public or private. Families would be free to add their own money and buy more expensive educations for their children. Hence, we would subsidize an education marketplace that would rapidly stratify by income level far more than it has already. Any hope of equal opportunity would fly out the window. Let’s say a voucher (or education savings account, as the Republicans have renamed it) was worth $10,000 per elementary school student. Some families would use the money to send their children to schools charging $40,000 in tuition, making up the difference with their own funds. Others would buy $30,000 educations, others $20,000 educations. But the majority of families — who love their children just as much — would settle for $10,000-a-year schools, because they could not afford anything more. The education marketplace would come to resemble the marketplace for any other consumer good: We would have Mercedes and Cadillac schools, but many children would wind up in the equivalent of used cars. It doesn’t have to be that way. We could create more choice among public schools, making a similar public investment in each child (except for those with disabilities or other special needs, in which case we could invest more). We could also increase the diversity of learning models by creating more public charter schools. Many people are confused by charters, but the concept is simple. Charter schools are public schools operated independently of school districts, mostly by nonprofit organizations. Although they are not allowed to discriminate, they are free of many of the regulations states and school districts use to control traditional public schools. Hence, they can create innovative learning models, from dual-language immersion schools to project-based learning to public boarding schools for children with difficult home lives. They can also hire the strongest teachers, fire the weakest, and set pay scales where they need to be to attract talent. Almost all charters are schools of choice. But they cannot select their students, as many public magnet and exam-based schools do. By law, if more students want places than there are seats, charter school must hold some kind of lottery in which every family has an equal shot. Though they are operated by private organizations, charter schools are in this way more public than many traditional public schools. In places with many charters, such as Washington, D.C., where almost half the public school students attend charters, and New Orleans, where 98 percent do, families choose from an astonishing variety of schools. Some states also allow parents to select a public school in another district, if seats are available. And many districts allow parents to choose among traditional public schools. Charter schools inject new, innovative school models into the system, ensuring that choice means the ability to choose something other than the cookie-cutter public schools most of us attended. Some states and cities also have voucher programs that are available to poor, urban students. These expand opportunity for low-income children, which is a good thing. But Republican leaders want vouchers for everyone, and a few states have already made significant strides in that direction. Fortunately, voters in Arizona last fall turned back the most aggressive program, which would have eventually made vouchers available to all. Economic inequality has been on the rise in this country for 40 years, and for the health of our society, we need to reverse the trend. Public school choice can help do so by increasing equal opportunity, if done right. Some districts have long used it to integrate their schools by income levels, to make sure they don’t have some schools for more affluent students and others for low-income students. But private school choice for all would eliminate equal opportunity in education. So as we celebrate National School Choice Week, let’s be careful to specify what kind of choice we want. The decisions we make will have a profound impact on the future of our society. David Osborne, whose latest book is Reinventing America’s Schools: Creating a 21st Century Education System, leads the K-12 education work of the Progressive Policy Institute.